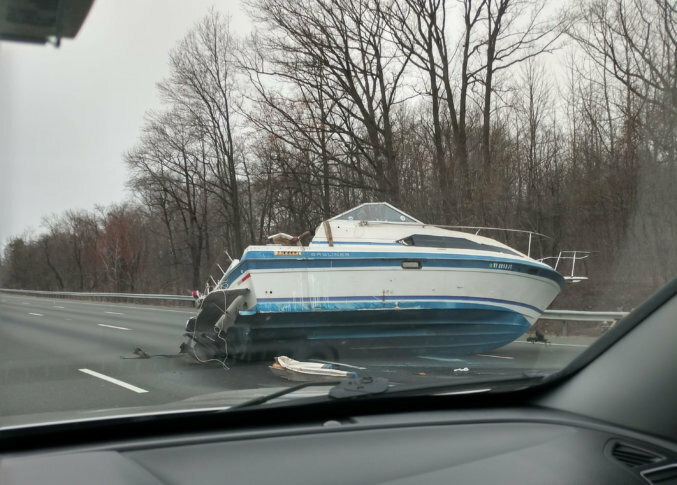 If you were on the Inner Loop of the Capital Beltway in Maryland on Monday afternoon and saw something you don’t often see on the highway: No your eyes did not deceive you, that really was a boat. The vessel apparently ran aground after falling from a trailer in Prince George’s County near Maryland Route 221/Ritchie Marlboro Road, past Exit 13. The boat initially blocked up to three right-hand lanes, but was later pulled out to the shoulder, where it continued to block the attention of drivers. The boat eventually weighed anchor, leaving drivers to tell their fish tales about a boat that was this big that clogged traffic on the Beltway. Believe it or not, this is not the first time that a wayward vessel has brought delays to the Beltway. In August 2013, WTOP reported that an abandoned boat blocked a lane of traffic on the Capital Beltway in Prince George’s County. That incident also turned heads and caused some serious delays. No matter what the source of traffic in your commute may be, use WTOP Traffic as your lighthouse to guide you through the troubled seas.